Margaret Huxtable has given her youth in order to keep her promise to her dying father to hold the family together until her sisters and brother have grown up. She gave up the chance to marry Crispin Dew, the man she loved, and suffered the pain of learning that he married someone else. But now her siblings are grown up, and her sisters are married. She is thirty years old and has decided that it is time she married too since the alternative is to be a spinster sister dependent upon her brother and sisters for the rest of her life. She knows whom she will marry. 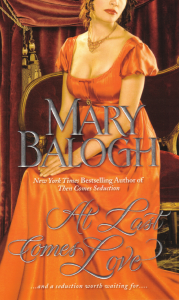 The Marquess of Allingham has asked her several times over the past few years, and each time she has refused. Now she will accept. She has made that decision before setting off for London and the Season. But in London she meets the now-widowed Crispin again and she learns a painful truth about the Marquess of Allingham-just after salving her pride with Crispin by telling him that she is betrothed. She finds herself in an embarrassing situation at Lady Tindell’s ball, the first she attends. And then, as she flees the ballroom in near-panic, she collides with the very notorious Earl of Sheringford. Duncan Pennethorne is the Earl of Sheringford, but his is only a courtesy title. While his grandfather, the Marquess of Claverbrook, lives, Duncan is dependent upon him. And his grandfather has just cut him off without a penny five years after terrible scandal banished him from London and polite society. For private reasons of his own, Duncan is desperate for money and the home he has always considered his own. And so he returns to London to plead with his grandfather. There is only one way out for him. He must marry someone respectable, someone of whom his grandfather approves, before the marquess’s eightieth birthday–which happens to be in two weeks time. There is no time to lose. Duncan attends the very first ball following the ultimatum, though he has not been invited. He is desperately looking over the likely matrimonial prospects when someone who is not looking where she is going collides with him. Margaret is at Lady Tindell’s ball, anxiously hoping that Crispin Dew will not show up and that the Marquess of Allingham will. As she takes to the floor for the opening set with Baron Montford, her brother-in-law, neither one has yet arrived. Duncan, meanwhile, is also late arriving. The ton will not take kindly to his appearance, uninvited, at a grand ball. Besides, he has no wish whatsoever to marry. He lingers at his club for one more drink. There was still no sign of the Marquess of Allingham. Nor, to her relief, of Crispin Dew. The music began, and Margaret curtsied with the line of ladies to a bowing Jasper in the line of gentlemen and gave herself up to the enjoyment of the intricate figures of the dance. She always loved the sound of the violins and the rhythmic thumping of the dancers’ feet. But halfway through the set she was distracted by the sight of a swath of scarlet at the ballroom doors and saw that it was Crispin arriving with two of the officers with whom he had been riding yesterday. Her heart fluttered uncomfortably and sank in the direction of her slippers. The three of them were causing a noticeable stir among those who were not dancing. He looked about until his eyes found Margaret, and then he smiled. She might have pretended that she had not seen him, she supposed, but that would be silly. She smiled in return and was very glad she was looking her best as she danced beneath one of the chandeliers and her gold gown sparkled. And then she felt annoyance at such a vain thought. She had stumbled awkwardly too, and he had to grasp her arm until she had righted herself and picked up the steps of the dance again. It was very humiliating. A few of the dancers around them looked at her with concern. Margaret looked at him, startled. And it was no use pretending that she did not know what he meant. He had obviously seen Crispin too and guessed from his uniform who he was. That meant that Katherine had told him the story. How embarrassing! She was thirty years old and a spinster because the only love of her life had abandoned her and married someone else. And all she had to do was see him again and she went stumbling over the feet of her dancing partner. The pattern of the dance separated them for a while, but Margaret replied as soon as they came together again between the lines to circle each other back to back. Which was a remarkably ridiculous thing to say. What all happened years ago, he might well ask. And how would she even be able to refer to it if she had forgotten it? She had only made herself look more abject in her brother-in-law’s eyes. Oh, how she hated this! Where had the years gone? And how had she somehow been left behind? And where was the Marquess of Allingham when she most needed him? Whatever would she say to Crispin if he talked to her later and asked where her betrothed was? She was just going to have to tell the truth, that was all–that there was no such man, that there was no such betrothal. And she must not even add the face-saving words not yet, anyway. She would thereby risk humiliating herself further if for some reason the marquess was not in town this year. And let her learn her lesson from this. She would never allow herself to be goaded into telling a lie again–even the smallest of white lies. Lies could only bring one grief. And then suddenly, just before the set came to an end, there he was at last–the Marquess of Allingham, strolling through the ballroom doors, looking dearly familiar. He stopped to look about. He had not seen her yet, Margaret realized as she circled about Jasper again and returned to her line. But that did not matter. The important thing was that he was here–and looking very distinguished indeed in his black and white evening clothes. There was a natural stateliness of manner about him. He must have seen someone else he knew and moved purposefully in that direction. The set came to an end and she rested her hand on Jasper’s sleeve. Before they reached the place where Vanessa and Elliott were standing with Katherine, Margaret saw that they were about to pass close to the Marquess of Allingham. At the same moment he spotted her, and his face lit up with a warm smile as he stepped away from the group he had just joined. “My lord.” She curtsied and stayed where she was while Jasper continued on his way after returning the greeting. “I do indeed,” she told him. “Shall we agree to the set after this next one, then?” he suggested. And perhaps another set later in the evening–a waltz, she hoped. He waltzed well. It amazed her now that she had not accepted his offer last year. Even then she had known that she must marry if she was not to remain a spinster for the rest of her life and be a burden upon Stephen and her sisters. And even then she had known that she could not possibly do better than marry the Marquess of Allingham, whom she liked exceedingly well. He took her by the elbow and turned her toward the group of people with whom he had been standing. Margaret did not hear the rest of the introductions. He was betrothed. To someone else. For the moment the realization bounced off the outer layer of her consciousness and did not really penetrate–which was perhaps fortunate. 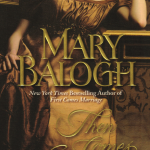 Margaret smiled–brightly and warmly–and held out her right hand to Miss Milfort. She smiled–very brightly and warmly–at Mrs. Yendle and the other members of the group and inclined her head affably to them. Another lie. Untruths had come easily to her tongue recently. “The next set is forming,” remarked a lady whose name Margaret had entirely missed, and the marquess extended a hand toward Miss Milfort. With her peripheral vision Margaret became aware of a flash of scarlet off to her right. Without even turning her head to look she knew it was Crispin and that he was making his way toward her, perhaps to ask her to dance with him, perhaps to seek an introduction to the Marquess of Allingham, who was betrothed to someone else. The ghastly truth rushed at her. She was not about to be engaged. She was thirty years old and horribly, irreparably single and unattached. And she was going to have to admit it all to Crispin, who had believed that she needed his gallantry since no other man could possibly want to offer her his company. Her stomach clenched with distress and incipient queasiness. She could not bear to face him just yet. She really could not. She might well cast herself, weeping, into his arms. She needed time to compose herself. She needed to be alone. She turned blindly in the direction of the ballroom doors and the relative privacy of the ladies’ withdrawing room beyond. She did not even take the time to skirt the perimeter of the room but hurried across it, thankful that enough dancers had gathered there to prevent her from looking too conspicuous. She felt horribly conspicuous anyway. She remembered to smile. As she approached the doors, she glanced back over her shoulder to see if Crispin was coming after her. She was in a ridiculous panic. Even she knew it was ridiculous, but the trouble with panic was that it was beyond one’s power to control. She turned her head to face the front again, but she did so too late to stop herself from plowing into a gentleman who was standing before the doors, blocking the way. She felt for a moment as if all the breath had been knocked from her body. And then she felt a horrible embarrassment to add to her confusion and panic. She was pressed against a very solid male body from shoulders to knees, and she was being held in place there by two hands that gripped her upper arms like a vise. “I am so sorry,” she said, tipping back her head and pushing her hands against his broad chest in a vain effort to put some distance between them so that she could step around him and hurry on her way. She found herself gazing up into very black eyes set in a harsh, narrow, angular, dark-hued face–an almost ugly face framed by hair as dark as his eyes. “Excuse me,” she said when his grip on her arms did not loosen. Margaret was startled out of her panic. His breath smelled of liquor. There had been no ball the evening after Duncan’s interview with his grandfather. Not one single one. London positively teemed with lavish entertainments every day and night of the Season, but for that one infernal evening there had been nothing to choose among except a soiree that was being hosted by a lady who was a notable bluestocking and would doubtless be attended by politicians and scholars and poets and intelligent ladies, and a concert with a program clearly designed for the musically discerning and not for anyone who happened to be shopping in a hurry at the marriage mart. Duncan had not attended either but had been forced to waste one of his precious fifteen days. He had gone to Jackson’s Boxing Salon yesterday afternoon when he might, he thought too late, have joined the afternoon promenade in Hyde Park to look over the crop of prospective brides. And today, when he had thought of going there, rain had been spitting intermittently from low, gray clouds, and all he met were a few hardy fellow riders–all male–and one closed carriage filled with dowagers. He had been reminded of those dreams in which one tried to run but found it impossible to move even as fast as a crawl. But tonight there was Lady Tindell’s ball to attend, and it was a promising event. According to his mother, who planned to be there, it was always one of the grand squeezes of the Season since Lady Tindell was renowned for her lavish suppers. Everyone who was anyone would be there, including, Duncan fervently hoped, armies of young, marriageable hopefuls who were running out of time left in the Season to find husbands. It was enough to make him feel positively ill. He had not told his mother about his grandfather’s ultimatum though he might have to enlist her help if he found himself unable to come up with a bride on his own within the next few days. His mother knew everybody. She would be sure to know which girls–and, more important, which parents–were desperate enough to take a man of such notorious reputation in such indecent haste. He arrived late. It was perhaps not a wise thing to do when time was of the very essence, but earlier in the evening he had acquired cold feet–the almost inevitable consequence of having been forced to wait more than twenty-four hours to begin implementing his search–and had stayed at White’s long after he had finished his dinner and his companions had left to go about their evening business, some of them to attend this very ball. He might have come with them and hoped to enter the ballroom almost unnoticed. Instead he had stayed to fortify himself with another glass of port–only to discover that fortification had demanded several more glasses of port than just one. He did not have an invitation to the ball, but he did not fear being turned away–not after a few glasses of port, anyway. He was, after all, the Earl of Sheringford. And if anyone remembered the rather spectacular scandal of five years ago, as everyone surely would–well, they would undoubtedly be avid with curiosity to discover what had become of him in the intervening years and how he would behave now that he was back. Duncan wondered suddenly if any of the Turners were in town this year and fervently hoped not. It would not be a comfortable thing to come face to face with Randolph Turner in particular—the man he had cuckolded. He was not turned away from the ball. But of course he had arrived late enough that there was no longer any sign of a receiving line or even of a majordomo to announce him. He stepped into the ballroom, having left his hat and cloak downstairs in the care of a footman, and looked about him. He felt very much on display and half expected that after all there would be a rush of outraged persons, led by ladies, to expel him into outer darkness. It did not happen, though undoubtedly he was attracting some attention. He could hear a slightly heightened buzz of sound off to his right. It was indeed a squeeze of a ball. If everyone decided to dance, they would have to push out the walls. And if everyone decided to rush him… Well, he would be squashed as flat as a pancake. He had arrived between sets, but couples were gathering on the floor for the next one. Good! He would be able to view the matrimonial prospects at his leisure provided that buzz of interest to his right did not develop into a swell of outrage to fill the ballroom. He could see Con Huxtable and a few other male acquaintances some distance away, but he made no move to join them. He would become too involved in conversation if he did and perhaps allow himself to be borne off to the card room. He would be willing enough, by God. He could feel his mood turn bleaker and blacker with every passing second. This ought not to be happening. He had not planned to go wife hunting yet–or perhaps ever. He had certainly not planned to come to London any year soon. How the devil was he to begin? There were pretty women and plain ones, young ones and old ones, animated ones and listless ones–that last group being the wallflowers, he suspected. Most of them, indeed, were still standing on the sidelines, nary a partner in sight though the dancing was about to resume. He should probably concentrate his attention upon them. It was one devil of a way to choose a bride! Pick the most bored looking wallflower and offer to brighten her life. Offer her marriage with a man who had abandoned his last bride almost literally at the altar in order to run off with her married sister-in-law and live in sin with her for almost five years. A man who had no wish whatsoever to marry but was being forced into it by the threat of penury. A man who no longer believed in romantic love and had never practiced fidelity. A man with an illegitimate child he refused to hide away in some dark corner of the country. He had fixed his narrowed gaze upon a mousy-haired young girl who, if his eyes did not deceive him from this distance, had a flat chest and a bad case of facial spots, and who was beginning to notice his scrutiny and look decidedly frightened by it, when he was distracted. A missile almost bowled him off his feet–something hurled his way in order to expel him after all, perhaps? He clamped his hands about the two arms of the missile in order to save himself from landing flat on his back–what a spectacular reentry into society that would be!–and realized that it was a human missile. A female human, to be exact. She was all generously sized breasts and delicious curves and subtly fragrant dark hair. And when she tipped back her head to apologize, she revealed a face that did the body full justice, by thunder. She had wide eyes and a porcelain complexion and features that had been arranged on her face for maximum effect. She was loveliness personified from head to toe. He held her against him longer than was necessary–and far longer than was wise in such a public setting, when his sudden appearance was already provoking attention. But she would surely fall over if he released her too soon, he reasoned. She had long legs–he could feel them against his own. She was beautiful and voluptuous–and pressed by some happy chance to his body. Could any warm-blooded male ask for more? Privacy and nakedness and a soft bed, perhaps? The only negative thing that could be said about her–on the spur of the moment anyway–was that she was not young. She was probably his own age give or take a couple of years. That was not at all young for a woman. She was undoubtedly married, then. She must have been snaffled up off the marriage mart ten or twelve years ago. She probably had half a dozen children. A pity that. But fate was ever a joker. He must not expect his search to be this easily or happily concluded. There was no ring on the left hand that was splayed over his chest, though, he noticed. All of which thoughts and observations flashed through his head in a matter of moments. “Excuse me,” she said, flushing and looking even more beautiful, if that were possible. She was pushing at his chest. Trying to get away. There was no harm in being hopeful, was there? He felt her body grow still and watched the arrested look on her face. Then her eyebrows arched above her eyes–and even they were lovely. It was no wonder some poets wrote poems to their ladies’ eyebrows. “Does it have to be in that order?” she asked him. Ah. An intriguing answer indeed. An answer in the form of a question. She had bowled him over after all–and rendered him temporarily speechless.